Taking your dog to a groomer's appointment and dropping him off seems simple, but it really isn't. If you're not checking your groomer's license, providing your dog's health info, and asking for details after the session, find out why you should. By law, the grooming salon is responsible to display the business license, as well as the grooming licenses of each stylist, in clear view. They are also required by law to carry a minimum of one million dollars in liability insurance, so be sure to ask about them if you don't see them. Licensing means both your groomer and the establishment have met certain standards that ultimately provide your dog a safer experience. On the very first visit, any responsible groomer will ask all new clients to fill out a grooming card. A grooming card includes your vet's number, your cell and home phone numbers and who to call in case of an emergency. 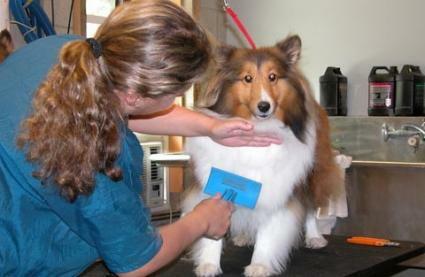 Any grooming shop worth its salt makes sure that each canine client is up to date on its vaccinations. This ensures the greater safety of all the clients against many contagious diseases. You should also expect to provide additional info about your dog's health such as whether he has a murmur, arthritis or any other condition that might be relevant. It's important that your groomer knows these things in case you dog becomes ill while being groomed. Accidents can happen at even the most reputable grooming salons. Razor burns, nicks, styling mishaps and nails clipped too short can all happen when working on a wiggly dog. Stylists are sometimes even bitten by a frightened dog. These things can still happen even if you have been going to the same groomer for twenty years; that's why they are called accidents. In the case of an emergency, a good groomer will notify you immediately and make sure that your dog receives proper medical care as needed. Taking a moment to make sure your groomer is properly licensed and insured is the first step to ensuring your dog is being left in good hands. Our dogs usually experience some amount of stress while being groomed, but severe stress might be a sign that something went wrong. A good groomer will recognize the signs of stress in your pet and call you if your dog is so stressed that the session cannot be completed. Should you notice any of these signs when picking up your dog, please take a moment to talk with your groomer and find out what happened. If you are not happy with the explanation you receive, it may be time to find a new grooming salon. However, if this was a one-time event that happened under reasonable circumstances, take your dog home and give him a lot of love. Have a treat ready when you pick him up and make time to take him to the park for a nice walk to remove the stress of the day. The idea here is to make grooming day a fun day for your dog. Do your best to ensure his safety, be prepared to help him deal with post-grooming stress and take care of his coat between trips to the shop so his grooming session won't be traumatic.